The following article will help you understand how to enable/disable and customize the lists from your MailChimp account and get the ready to be used with WPUM. WPUM MailChimp is capable of working with one or more lists at the same time. 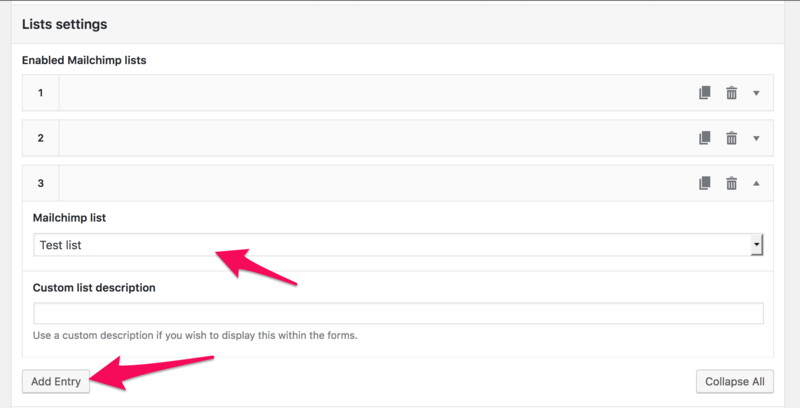 For example, your users can decide to signup to one or more lists. Once you've decided which lists you want to use with WPUM, navigate to Users -> MailChimp in your WordPress dashboard and locate the "Enabled Mailchimp lists" option. There you will see an editor for your lists. Click the "Add entry" button to add a new list. Once clicked, you'll be able to select which list you wish to add and if needed, you can type a custom description for the list. Press the save changes button once you're finished. If you're using multiple lists, you can also choose to change the order with which they appear on your site. In order to do so, click and then drag & drop the list row. Press the save changes button once you're finished. Sometimes you might want to display a custom description within the form. Each list on your site can have it's own description. Enter the description you wish to display into the "custom list description" setting. Press the save changes button once you're finished. The description will be used in place of the list name within your forms.